It's no secret that I loves me some flicked liner, but it might surprise you to know that I regularly get asked about how I do my flick. It's especially astonishing when you remember that my eyes are deepset and hooded, so 95% of my eye makeup isn't visible from most angles. There are plenty of "perfect flicked eyeliner!" tutorials on YouTube, but I don't consider this particular version "perfect flicked eyeliner"--that varies so much from person to person--and I haven't really seen any versions by people with barely-visible lids. I figured I'd post a sort of step-by-step eyeliner flick template. 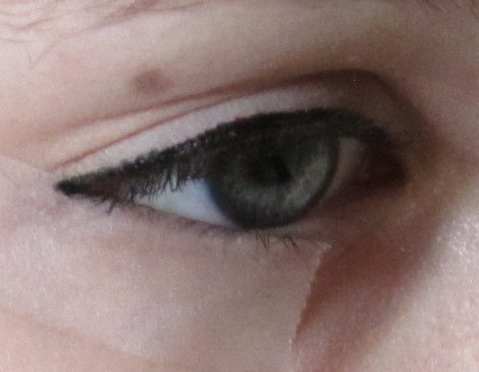 I call it template rather than a tutorial because this is just a super-basic eyeliner flick that you can (and should) modify based on your eye shape, personal preferences, etc. The liquid liner I generally recommend to beginners is Jordana Fabu-liner. 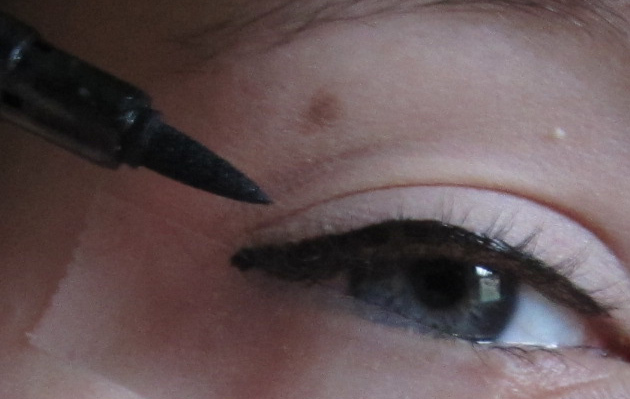 It's $2, very black, water-resistant but not so strong you can't get it off at the end of the day, and the felt tip is really nice for those who aren't used to liquid liner, as it's basically like drawing with a marker. Also, the felt tip is firm enough for you to get a smooth line, but it's also soft enough that it doesn't scratch. 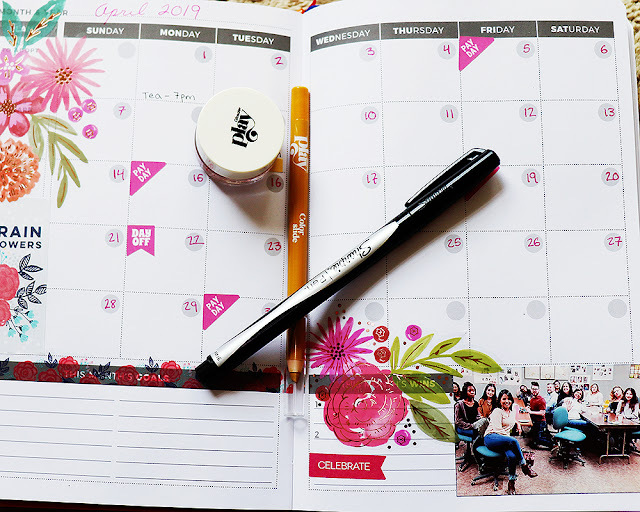 With a felt-tip liner like Fabu-liner, it's often best to hold it so that you're applying the product with the TIP of the brush, not the side. This gives you a thinner, more precise line, and you can build up the liner thickness you want as you go. 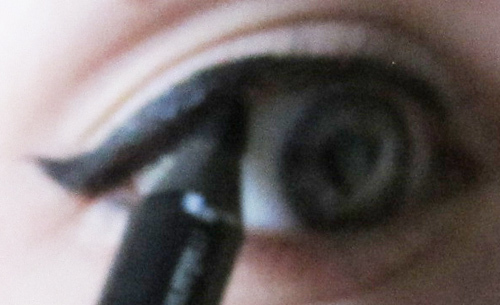 I actually tend to hold my Fabu-liner like a pen and literally draw on my eyelid. 2. Take your time. I've been doing winged liner regularly for about 2 years straight, but I still take a good 5 minutes to finish the liner on both of my eyes. Granted, part of that is me just taking my time because I find applying my makeup relaxing, but even when I'm rushed, I can't finish my liner in under a minute and have it look the way I love it to. 3. Eyeliner flicks are sisters, not twins. They're just like your brows, your nostrils, your eye shape, etc. Pretty much NO ONE is going to notice that the flick on your left eye is a little thicker and a smidge more vertical than the one on your right. Before I start my liner, I prime my lids and apply any shadow I plan on using. If your eyelids are really dry or oily, or if you plan on wearing your eyeliner for a super-long time, I highly recommend priming your lids. 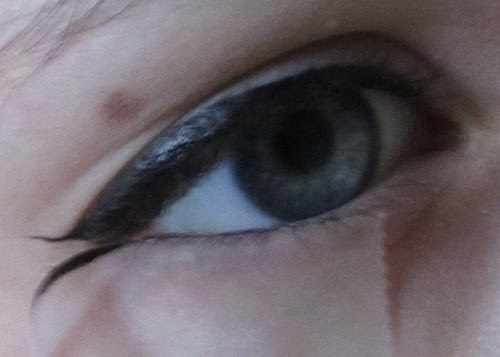 If you're new to flicked eyeliner, it's a good idea to use a piece of clear tape as a guideline. Stick a piece to the back of your hand (so it won't yank the skin around your eye too hard later), then apply it to your lower lashline, making sure you tuck the tape UNDER your bottom lashes. The angle you apply the tape at will, of course, alter the angle of your flick. The usual guideline is to "follow your bottom lashline," which I often do (and did here), but you can tilt the tape up higher for a more vertical flick, or down lower for a horizontal flick. 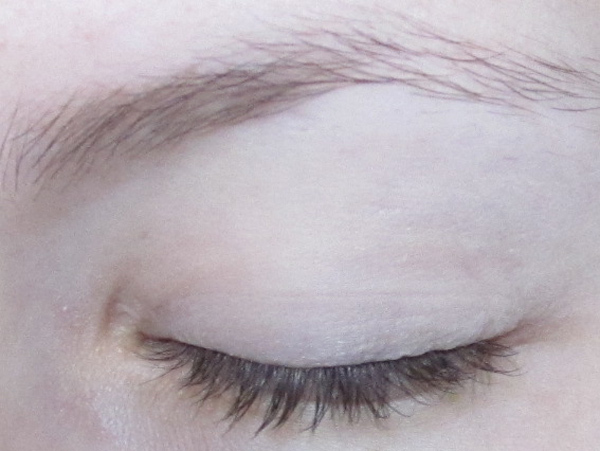 Draw a line across your upper lashline using small, short strokes. Some people start at the inner corner, but most people--including me--find it easier to start at the outer corner and work inwards. Don't fuss about getting it perfectly smooth; just get the color down. Make sure you use the tip of your liner brush to get in between your lashes and cover up the skin (Fabu-liner's dark-yet-liquidy formula is especially nice for this, as it doesn't leave gunk on your lashes). Do the same on your other eye. You'll notice that I'm already drawing over top of the tape; this is so I can make sure my flick is nice and dark, and I don't have any bare skin spots showing. Feel free to draw over the tape, like a house painter with paint. Go as far in as you want and as thick as you want. 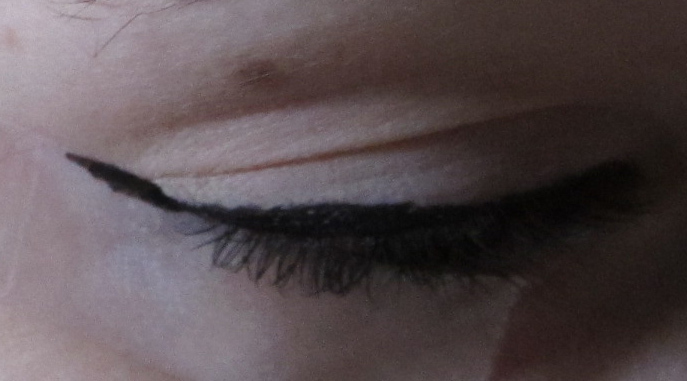 I generally keep my liner very thin on the inner half and just short of the actual inner corner of my eyes, then I make the liner on the outer half thicker. I just like how it looks on my eyes. Using the tape as a guideline, draw a line that extends out from your lash line. Draw right over the tape without fear! Notice the chunk of "blank skin" between the flick and the base line you drew? Fill it in with liner. I tend to do "back strokes" for this, drawing from the flick back in to the base line. Carefully pull the tape away. This will leave a pretty clean, sharp line. It looks a bit funny in this picture because the flick is just kind of "floating." It's a good idea to gently tug the outer corner of your eye up and out to make the skin taut, then use your liquid liner to connect the flick to your lower lashline. Basically, you draw under the flick to thicken it. You can also apply liner to your lower lashline, but my eyes are small, so I generally avoid that. Now it's time to darken it up! 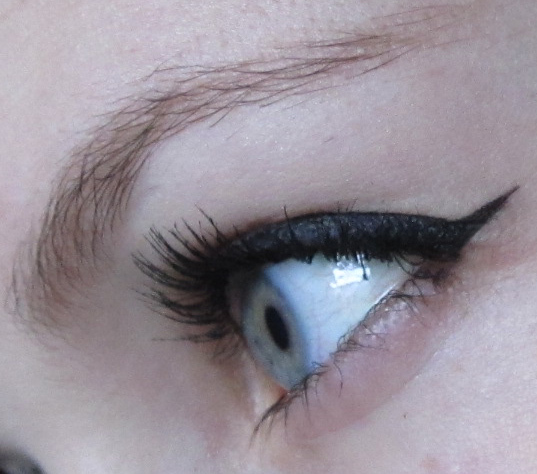 Completely optional, but I think this makes winged liner look even better. I tightline my upper waterline with a dark black pencil; my favorite is Milani Liquif-Eye. 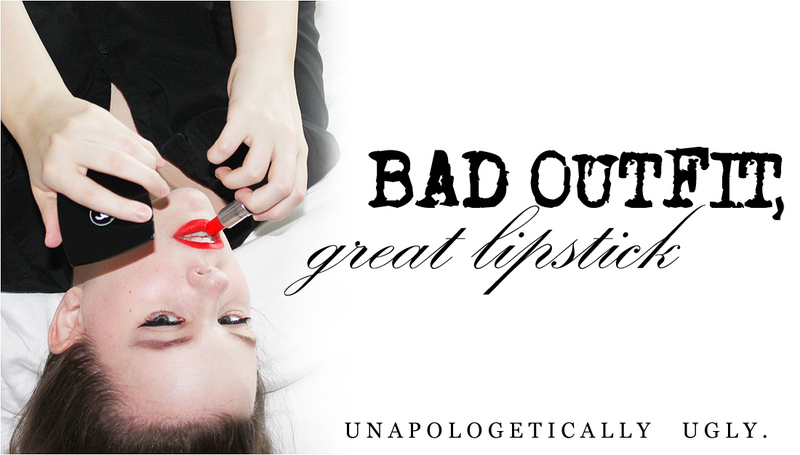 I find that it helps to turn sideways and look in the mirror that way; you'll have a better view of your waterline. Rub the pencil up in to the lashes to hide any showing bits of skin. 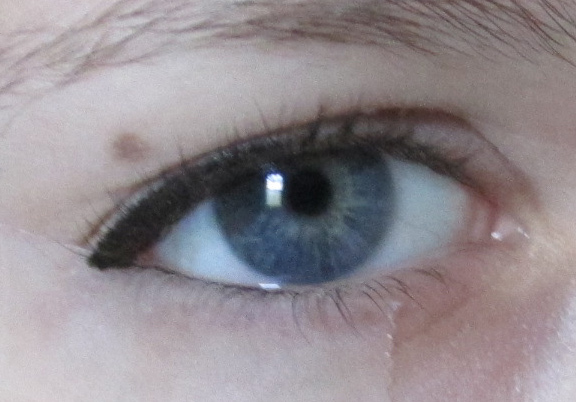 Applying your mascara can also darken things up. (I used Chanel Inimitable Intense for this look.) Use the ol "wiggle your mascara wand at the base of your lashes" trick, and you'll deposit some extra product along the lashline, plus make your whole look more dramatic. It can also help to add more mascara to the outer third of your lashes, as it draws more attention to your flick. And that's it! Sharp, black, very basic, and uber-easy to do with a bit of patience and practice.